The chips aren't officially out yet, but overclockers are already setting world records with the new AMD Ryzen 2000 series. 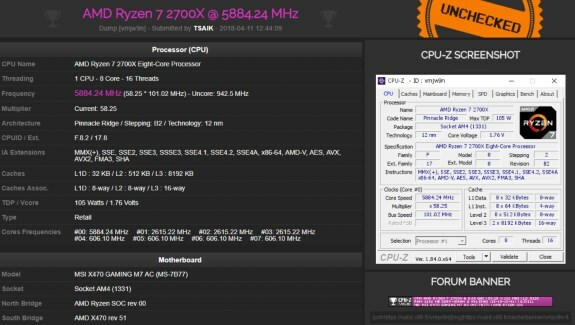 TSAIK overclocked the AMD Ryzen 7 2700X to 5884.24MHz and a Ryzen 5 2600X to 5882.97MHz. The highest clock achieved and verified by HWBot is 5905 MHz on Ryzen 5 1600X. The highest frequency for Ryzen 7 1800X is 5803 MHz. Both records were broken by der8auer.